We have this discussion thanks to Nissanmama! 1. What do you think Aro meant when he said to Caius, “Take a moment to ponder, for the justice we intended to deliver no longer applies”? 2. Were you expecting a more violent confrontation when you began the chapter? 3. Do you think Caius enjoys killing or is genuinely interested in justice? 4. Were you surprised by the expansion of Bella’s talent or did you think she would have some other talent when the confrontation with the Volturi actually arrived? 5. How many different ways do you see the chapter’s title, “Bloodlust” applying to the characters and events that take place? He realizes that with their witnesses present it would be wrong to accuse and punish the Cullen's for breaking a law that is clearly not broken and that would reflect badly on the Volturi. However, there is a double meaning to his statement. 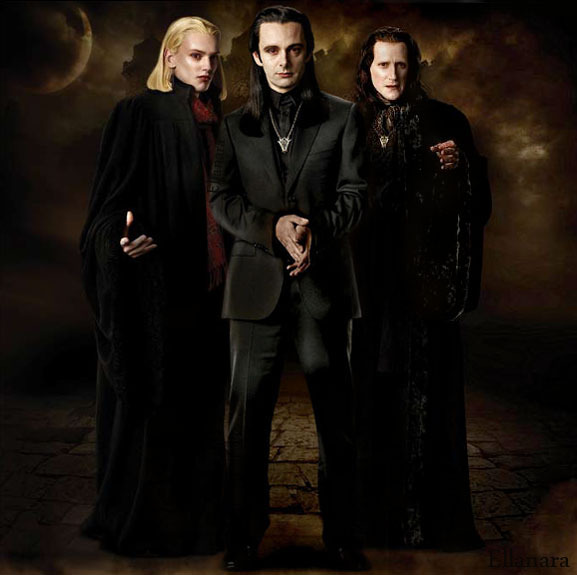 Edward mentioned earlier that the Volturi would have more than one reason for punishing them. Aro wants Caius to consider one of the other reasons to punish the Cullen's and figure out one that does apply to the situation. I don't know exactly what I was expecting. I figured it would be a big production because of Aro's need to make things into some kind of theatrical scene. I kind of liked the way this chapter played out because it is a game of strategy and not just who can destroy who faster. It fits the vampires personalities very nicely. I sort of think he just enjoys it. It's his way of getting rid of vampires he does not deem worthy of being part of their world. So I guess to him killing is justice. I wasn't really surprised, but I was excited for her. I guess I always sort of figured she would save the day lol. The whole saga has been about her and it was only fitting that she should get to keep her happy ending that she worked so hard for. I see it in the sense that the Cullen's and their friends want to expose the Volturi for what they really are and if it comes to it, to see them taken down. 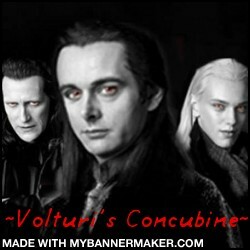 I also see the Volturi wanting to punish the Cullen's for absolutely anything they can come up with. 1. What do you think Aro meant when he said to Caius, “Take a moment to ponder, for the justice we intended to deliver no longer applies”? Because thanks to he new developments what they thought they were going there for is not really wants happening. They need to make sure that if they are going to act & do anything there needs to be a valid reason. 2. Were you expecting a more violent confrontation when you began the chapter? I was definitely expecting something to happen & for it to be violent. 3. Do you think Caius enjoys killing or is genuinely interested in justice? I think for him if doing justice means killing (which it usually does in the vampire world) than that's what he'll do. It doesn't seem that bg a deal to him. 4. Were you surprised by the expansion of Bella’s talent or did you think she would have some other talent when the confrontation with the Volturi actually arrived? I wasn't really suprised that her talent expanded since she had been trying to workon it & control it beforehand. Now she just really had motivation to keep everything that she had, especially after going through so much to get it. 5. How many different ways do you see the chapter’s title, “Bloodlust” applying to the characters and events that take place? I mostly thought of it meaning the way the Volturi wanted to come & basically destory the Cullens. [quote="Alphie"]We have this discussion thanks to Nissanmama! 1. What do you think Aro meant when he said to Caius, “Take a moment to ponder, for the justice we intended to deliver no longer applies”? I agree with the double meaning: "Plan A failed; now we go to Plan B." 2. Were you expecting a more violent confrontation when you began the chapter? No. I had anticipated that someone would die, either as punishment from the Volturi, or from an impulse attack on the Volturi. 3. Do you think Caius enjoys killing or is genuinely interested in justice? Cauis does not appear to like change, therefore the killing of someone protects his world, and is justified. James and Victoria are characters who enjoyed killing. 4. Were you surprised by the expansion of Bella’s talent or did you think she would have some other talent when the confrontation with the Volturi actually arrived? The talent was a nice twist on her character - the hints were always there. Many - the Volturi would kill to achieve their desires; the Romanians, for a regime change, the Volturi witnesses reminded me of mob violence, like at a riot; and the wolfpack was prepared to kill to defend their territory and the Cullens. Exactly what Bella said,.. so he could find other reasons to accuse the Cullens of doing something wrong. Much more,.. I wasn't quite sure if they'd start fighting right away,.. I thought something would happen right away and then they'd talk. I think Aro likes the stories and opinions and hearing what people say and Caius is definitely more fighting and killing. I thought she might be able to protect herself, Edward and Renesmee,.. but then when she was getting everyone I was so relieved,.. it definitely would make fighting a lot more of a challenge. Made everything more interesting. Everyone was just ready to rumble. The wolfpack was already wanting to rip them apart, the Volturi were calm but ready to fight at any moment, the Voltrui witness were crazed and looking to riot and the Cullen entourage was ready after they realized what the Volturi was really doing. I think it was his way of saying ... ok, onto plan B. Simple as that. Yes and no. I figured there would be at least a minor skirmish, but I did not expect a full on battle. There is the small fight in Eclipse with Victoria and Edward. It didn't seem that Stephenie was that interested in huge fight scenes. Caius appears to be all about the battle. Get in there and start causing pain. I was excited that her talent really showed itself. It was cool for the geeky, shy girl to become protector. I loved her bloodlust, the growling and crouching and the total instinct to kick Volturi rear. How much space do I have?? Werewolves - thinking they'll have free reign on killing vamps. Romanians- thinking they would finally have revenge. Bella - ready to kill anyone and anything in the way of the safety of her child. Volturi - ready to take out the Cullen clan and keep the ones they like. And that isn't even getting deeply into the topic! That he was going to find another way to convict the Cullens. I wished there would be one, but I knew there wouldn't. I think he enjoys killing, haha. No, her talent seemed pretty normal to me. I think it might mean that the Volturi were hoping to have the blood of the Cullens, so to speak. Killing is his justice! But I just know, (Not think ) that he enjoys killing, comes with being sadistic. Seeing her have that non-mind penetrating power as a mere human, I did think that she would have something useful like a huge shield. How could Stephanie not make her main character have an awesome power? Well only really one, the Volturi were coming so it suited, because you know some stuff is going to go down when they show up! I weren't, because I was sure that the Cullens will survive this and when it would've came to a fight, some of them might of gotten killed. I think he just enjoyes killing, because the Cullens didn't do anything wrong but he kept looking for something to blame them for. I didn't think that she would have another talent, couse she was already gifted in many ways (the shield, self control). I was surprised by the expansion of the shield, but I was sure that she will save her family somehow. I see it mostly from the Volturi's side, they are coming to destroy the Cullens. I also see it from the Cullens side, they are ready to do anything to protect their family, including fighting the Volturi. He's still trying to hold to their image of benevolent rulers, and so is looking for another, legally compelling way to bring about the conclusion he desires. I wasn't sure it would go that way, no. I knew that people would have to die on both sides if fighting began, and I couldn't see the Cullens getting through without a death, and I couldn't think of anyone I was prepare to lose, with the possible exception of Rosalie. I think he's just there for the ripping and burning. I thought that it might grow a little larger when she, and more importantly, her family, were truly under threat. I think that everyone, with the possible exception of Carlisle, is lusting for blood (i.e. a fight) at this stage.